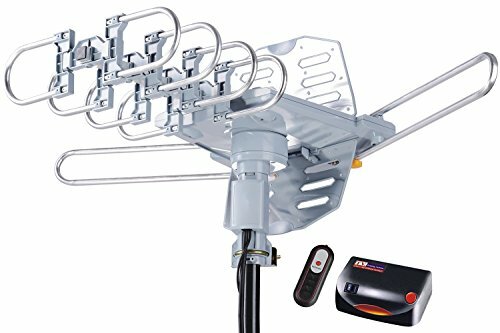 This Outdoor HDTV antenna is designed to receive digital TV UHF/VHF signals while providing high quality HDTV pictures. You can enjoy HDTV without the high cost of cable or satellite. With a built-in rotor, turn a full 360 degrees using the infrared remote control. Note: TV signal reception is immensely affected by the conditions such as antenna height, terrain, distance from broadcasting transmission antenna and output power of transmitter. Channels you can watch may vary depending on these conditions. 150 Miles Long Range and Dual TV Outputs -- HDTV support 720p, 1080p. Working Frequency: VHF 40~300 MHz, UHF 470~890 MHz. Receive free digital broadcast high HDTV signals. Support 2 TVs at the same time without a Splitter. No special Adaptor required. Tools-Free installation -- Snap on elements available. Comes with an easy-to-follow user manual so you can install the antenna with ease. Wireless Remote Controller -- Built-in 360 degree motor rotor. Built-in Super High Gain and Low Noise Amplifier. Include 40ft outdoor TV antenna Coaxial Cable. Easy for you to place it to get the best receptions. Weather Resistant -- McDuory antenna is lightning protected, durable design with grounding done. Superior construction to withstand tough outdoor weather conditions. McDuory Comprehensive Warranty - We stand behind our antenna 100% with a ONE year warranty and 45 days Money back. Please Note: Freeview receptions are dependent upon environmental factors, we can not guarantee receptions in all conditions. View More In TV Antennas. If you have any questions about this product by McDuory, contact us by completing and submitting the form below. If you are looking for a specif part number, please include it with your message. © 2019 - homeentertainmentcentersonline.com. All Rights Reserved.